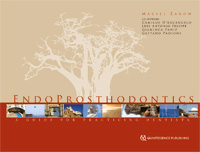 Written by an international group of renowned experts in the field of reconstruction of pulpless teeth, this is a very practical book explaining in detail, step by step, the general principles of correct decision-making in endodontics, reconstructions and aesthetics of root canal treated teeth. How to avoid fractures? Should we carry out retreatment, or use implants? Should we restore pulpless teeth with direct or indirect restorations? How we can bleach discolourations after teeth have been endo-treated? How can aesthetics be improved in compromised cases? Should we use fibre posts? How can sub-gingival defects be treated? Can we opt for porcelain veneers or ceramic crowns? The aim of the book is to answer these questions and help practising dentists make the right decisions, which often require making difficult choices. Each of the 10 chapters include detailed photographs of clinical cases, descriptions of technical procedures, and practical tips for dental practitioners. Chapter 01. Are root canal - treated teeth more fragile than vital teeth? Chapter 02. When to decide on retreatment and how to execute it? Chapter 03. When to use fiber posts to restore root canal - treated teeth? Chapter 04. How to prepare root canal - treated teeth for indirect restorations? Chapter 05. How to bleach discolored teeth? Chapter 06. How to obtain esthetic direct restoration in root canal - treated anterior teeth? Chapter 07. Can porcelain veneers be placed on root canal - treated teeth? Chapter 08. How to proceed in cases with subgingival defects? Chapter 09. How to restore discolored anterior teeth resistant to bleaching,simply and predictably? Managing Endodontic Failures in Practice, provides a concise, practical overview of the "when" and "how" to save teeth with an unsatisfactory, and often deteriorating endodontic outcome. From diagnosis to the monitoring of successfully retreated teeth, Managing Endodontic Failures in Practice is clearly the work of an endodontist "in the know" and "up to speed" on the latest thinking, developments and techniques. Ricucci, Domenico / Siqueira jr., José F.
Endodontology: An integrated biological and clinical view is a very unique collection of histological images combined with supporting text. Essentially, this is a work that is at the same time an atlas and a textbook about clinical endodontics, based on strong biological grounds that eliminate the gap between clinical practice and biological issues. It bridges the basic knowledge, which common endodontic textbooks provide, to an in-depth understanding of endodontic biology. Dentin bonding systems, composite resins, and fiber posts have widely replaced cast posts and amalgam as core materials. In addition, all-ceramic and composite crowns have replaced metal ceramic crowns for aesthetic restorations. This book provides the general practitioner with some principles and techniques for the adhesive restoration of endodontically treated teeth. In recent years, cone beam computed tomography (CBCT) has become much more widely available and utilised in all aspects of dentistry, including endodontics. Cone Beam Computed Tomography in Endodontics is designed to inform readers about the appropriate use of CBCT in endodontics, and enhance their clinical practice with this exciting imaging modality. Während zu den chirurgischen Aspekten der Implantologie reichlich Fachliteratur zur Verfügung steht, fehlt für die implantatprothetische Versorgung der Patienten - das eigentliche Ziel fast aller Implantationen - ein umfassendes, systematisches Lehr- und Handbuch. Die dentale Trickkiste ist eine Serie von Artikeln, die unter der gleichnamigen Rubrik in der Fachzeitschrift "Die Quintessenz - Die Monatszeitschrift für die gesamte Zahnmedizin" veröffentlicht wurde. In den Jahren von 2001 bis 2014 erschienen insgesamt 100 Folgen. 83 der Artikel sind in den beiden Buchausgaben der dentalen Trickkiste erschienen, welche sich mit rund 10.000 verkauften Exemplaren äußerst erfolgreich zeigten.